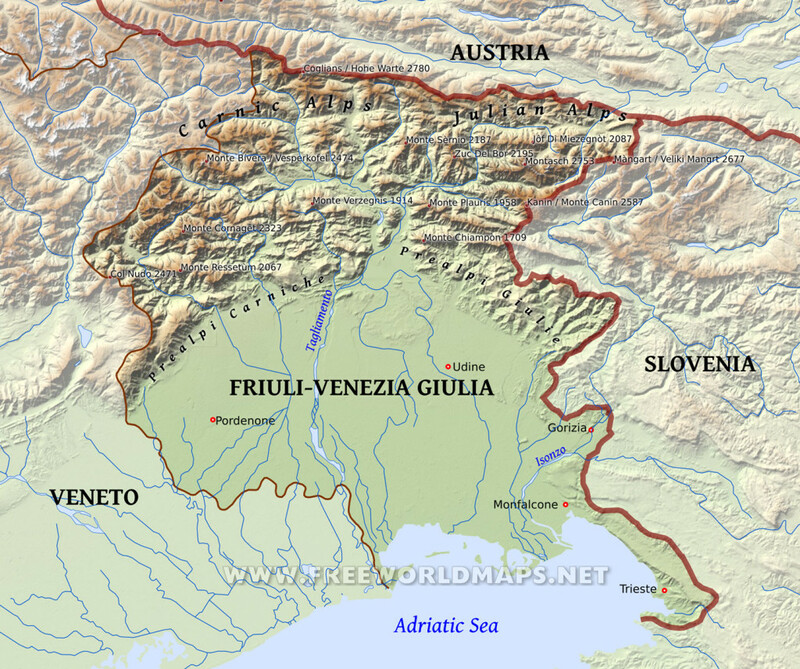 Friuli-Venezia Giulia has always been a bridge between the Mediterranean world and central Europe. The geographical complexity of Friuli-Venezia Giulia – around eight thousand square kilometres of alps, limestone plateau, alluvial plain and shelving coastlands – is mirrored in its social diversity. The mountainous north is ethnically and linguistically Alpine; the old peasant culture of Friuli, though now waning, still gives a degree of coherence to the area south of the mountains; Udine seems Venetian, and Grado, slumbering in its Adriatic lagoons, Byzantine-Venetian; while Aquileia, a few kilometres north of Grado, is still redolent of its Roman and early Christian past. And Trieste itself, the regional capital, is a Habsburg city, developed with Austrian capital to be the empire’s great southern port. In spirit and appearance it is central European, more like Ljubljana in Slovenia than anywhere else in the region with the possible exception of Gorizia. If one thing unites the different parts of the region, it’s how far removed they are from the conventional image of Italy, a remoteness that intensifies the further east you travel. This area has always been a bridge between the Mediterranean world and central Europe – that hazy multinational entity which begins, according to Eric Newby at least, at Monfalcone, north of Trieste. It has been invaded – sometimes enriched, often laid waste – from east and west and north, by the Romans, Huns, Goths, Lombards, Nazis and even the Cossacks. Venice in its heyday controlled the coast and plain as far as Udine; Napoleonic France succeeded the Venetian Republic, to be supplanted in turn by the Habsburgs. Earlier last century the region saw some of the fiercest fighting of World War I on the Carso (the plateau inland from Trieste), where artillery shells splintered the limestone into deadly shrapnel and the hills are still scarred with trenches. Vast war memorials and ossuaries punctuate the landscape: the bones of 60,000 soldiers lie at Oslavia, near Gorizia; 100,000 at Redipuglia; 25,000 in the Udine ossuary. While the Friulani want Italian nationality, they don’t care for the baggage of Italian identity. Respect for Rome and the government is in short supply, and enthusiasm for the separatist north Italian “League” movement has spread from Lombardy in recent years. It is unlikely that this marks the birth of Friulian separatism, but there’s no doubt that the people here have their own ways and traditions, fostering a strong sense of identity. Economically the region is in fairly good shape: Udine and Pordenone are thriving, while Trieste is a focus for container traffic and is becoming a centre of computer technology and electronics. Tourism is growing too. Increasing numbers of visitors, mostly Italian and German, are discovering places which almost rival the claims of the neighbouring Veneto, with none of the crowds or the cynical attitudes to tourists. Notwithstanding it’s post-industrial atmosphere, Trieste makes a good base for walking trips into the extraordinary, cave-riven landscape of the Carso, with the option of a day at one of the purpose-built beach resorts along the Triestine Riviera – which isn’t as glamorous as it sounds. Udine, with its beautiful Venetian centre and excellent art collections, is within easy reach to the north, as is tiny Cividale del Friuli, which preserves a picturesque historic centre perched on the gorge of the Natisone, as well as some fascinating Lombard remains. The archeologically minded will head straight for Aquileia, however, which has some of the most important Roman and early Christian remains in Italy, and is fifteen minutes from the lagoon resort of Grado, which conceals a tiny early Christian centre amid the beach hotels. Further north, towards the Austrian border, the Carnia is struggling to develop itself as a rival to the Dolomites for skiing and hiking, though in truth it has little over its neighbour other than peace and quiet. Plump gnocchi stuffed with juicy plums and then tossed in browned butter, sugar, and cinnamon? How about pasta filled with dried figs and ricotta, or even chocolate and walnuts? Yes, Italian food is more than just spaghetti, and tiny FriuliVenezia Giuliahidden from tourist mobs in Italy’s northeast cornerboasts one of the country’s most distinctive regional cuisines. With influences from Austria, Hungary, and Slovenia, the Friulian people cleverly merge humble, local ingredients with exotic spices from foreign lands, resulting in a cuisine that, while often surprising in its blend of sweet and savory flavors, never ceases to delight the palate. In Flavors of Friuli, Elisabeth Antoine Crawford has compiled eighty of Friuli’s traditional recipesincluding frico (Montasio cheese crisps) and gubana (dried fruit and nut spiral cake)and presents them with clear instructions that any home cook can easily follow.